I'm currently reading Nouman Ali Khan's 'Revive Your Heart: Putting Life in Perspective'. It's basically like a transcript of his talks. What does this have to do with parenting? I read it and thought wow this applies to children and families as well. Of course it does, as the speaker talks in general terms that applies to everything. But I'd like to make it specific to children and parenting. So I'm starting a parenting series based on the book. I won't use all chapters but only the ones that can be applied to parenting. So I'll take the basic concept of what Nouman Ali Khan writes and apply it to parenting. I'll start with Chapter 3 on giving advice and not critising. You must remember that giving advice is about helping someone. It is based on love and concern for your child and you want what's best for him. It's not about being right all the time and everyone else just follow your way of doing things. It's not a power struggle to be the most knowledgeable know-it-all person. It's not about critising your child's behaviour because you just don't like the way he does things or you don't like his choice. There are different ways of doing things and different preferences. Don't give advice on your personal preferences. Ask yourself if the advice you're about to give will make him a better Muslim. Will it make him a better Muslim to wear stripe socks instead of blue socks or will it be better for him to put the socks on his right foot first then the left? The right foot first of course because it's a sunnah whereas style is just a preference. These are just simple examples, I know, but they demonstrate what I mean. If you give advice then do so in a gentle loving manner, not accusingly or aggressively. Most people give advice like this, "That's haram! That's wrong! You shouldn't do that! You should do this..." Does it become easy to listen to this person's advice? No because it makes the person on the receiving end defensive. They put a high wall around themselves and stop listening. Worse, they defend themselves by arguing. During the teenage years, it seems that the only communication that children receive from their parents is one of criticism or correction. "You must do this...", "You should have done it this way...", "You ought to know better..." and "That's not how you do it..." seems to be what parents say to them. No wonder teenagers don't listen to their parents. It's not easy or pleasant to listen to this type of talk because it's not done from the heart in a loving and kind way. It's done in a negative and blaming way because parents are annoyed and impatient. I've written before on how the Prophet, peace and blessings be on him, gave advice, read it here. Once you give advice but your child doesn't take it then you don't get upset and you wash your hands of him and give up on him. You have patience and kindness. Remember when the Prophet, peace and blessings be on him, gave advice to the people of Taif? He advised them to worship Allah but they didn't want to listen and told the children to throw stones at him until he was bleeding. Even though they did this to him, he didn't became angry and he never gave up on them. He remained patient and he made dua for them. How did it end? They became the best of believers. 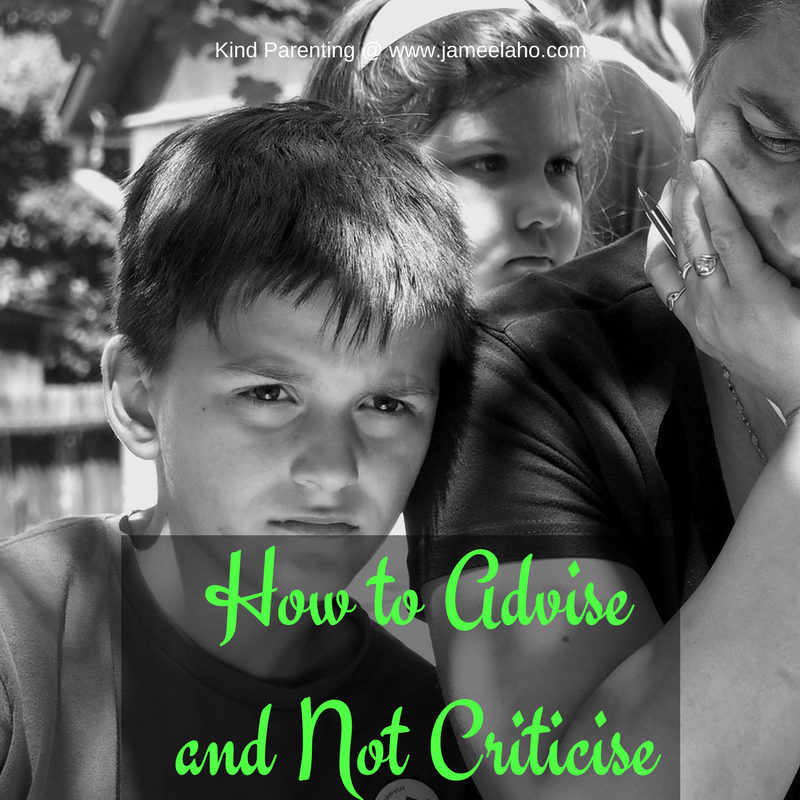 The last thing about giving advice is that if you give it then you must be able to take it graciously when someone offers it, even if it's from your child. The test of your selflessness and humbleness is to be able to listen to and accept someone else's advice to you. For more parenting tips and advice, subscribe to my mailing list below. I read your article minotely and got a good lesson and tips to behave with my kids. Thanks for the essential article helpful for all parents. Thank you. I'm glad it's helpful. Further I'm a good fan of you, downloaded all the articles written by you towards kids and parenting. I'm glad you've found the articles useful. May Allah bless your family and make your children the coolness of your eyes. Have you subscribed to my mailing list yet?